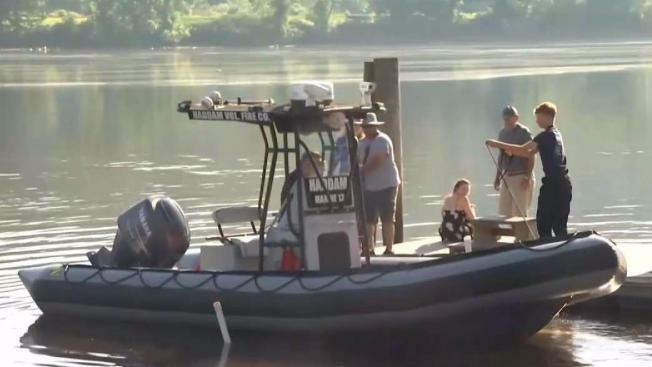 Authorities said 17-year-old Jay Agil jumped into the Connecticut River in Haddam on Sunday to save his sister. The search is over for a 17-year-old Meriden boy who had been missing since being swept into the Connecticut River Sunday. His body was found Tuesday morning. Jay Agli was swept into the Connecticut River in Haddam when he jumped in to save his 19-year-old sister, according to officials from the Department of Energy and Environmental Protection. Police said state troopers responded to the Haddam Meadows boat launch a little after 5 p.m. Sunday to find the teen. DEEP officials said Agli and another family member jumped into the river to save his sister and all three were swept away by the current. Authorities said it is likely that a wake swept the sister off a sandbar. A boater picker up the sister and the other family member, but there was no no sign of the 17-year-old until 11:45 a.m. Tuesday when the state police dive team found him south of Haddam Island, off Haddam Meadows State Park, near where he went into the water Sunday. Coast Guard said Monday that they believe the teen probably could not have survived based on the cold water temperature and the time that’s passed. "All of them were taken by the current. A passerby in a vessel came and rescued the 19-year-old sister and another family member. The 17-year-old victim we're searching for was not recovered," Colonel Kyle Overturf, of DEEP Environmental Conservation Police, said. Firefighters said this can be an especially dangerous time of the year to be in the river, with its strong currents and steep drop-offs, and they recommend that people swim in pools rather than in the Connecticut River. "What may seem tranquil on the surface may not be what's happening underneath," Chief Robert Kronenberger, of Middletown Fire, said. Officials were also trying to contact the boater who helped, asking the person to call 860-424-3333. The State Police Dive Team, along with the state police helicopter, Trooper One, EnCon Police, U.S. Coast Guard, Haddam Fire Department, and Middletown Fire Department and Dive Team were all involved in the search. People around the park Sunday said it was busy with people boating and cooling off in the water and regulars said the river can be tricky in the area. “There's a very strong current on the outside of the sandbar, so you have to be very cautious when deciding to swim off the sandbar," said Amanda Katie Santos, of New York. EnCon police continue to investigate and the state medical examiner will determine the cause of the teen's death.